You have access to the internal mail where alerts and internal messages are all sent. At the top right of the page you can access your internal mail box. The number of unread messages appears beside the inbox link. In this image above it shows 15. Click the link to be taken to the Messaging tools within the system. All message appear on the right. Messages can be sent by other users to your account. Additionally, any Performance Alerts are also sent through the internal mail. Select the users you require the message to go to by placing a tick beside their name. 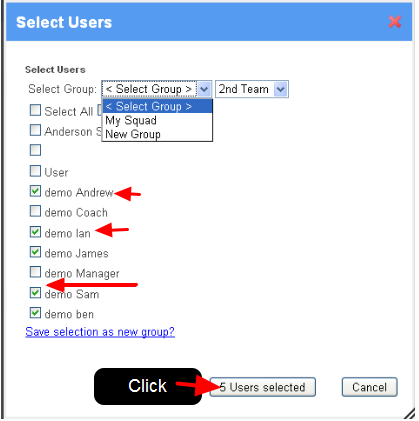 Alternatively, you can choose from different athlete groupings (including Personal Groups). Internal Only will be sent to their software's Internal mail inbox. Email will be sent to the e-mail address that they used when they signed up for the software e.g. a g-mail account. SMS (Text Message) will be sent to any cell-phone number that they have saved on their account settings. Email and Text Message will send the message to a cell phone and an external mail account such as g-mail. To Upload an attachment, click "Browse" and once you find the file click and upload it. 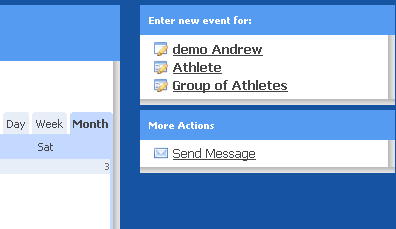 When you are viewing an athlete's calendar you can click on a "Send Message" button and the athlete who you are viewing will be selected to send a message to. The messaging component is exactly the same as that shown above. 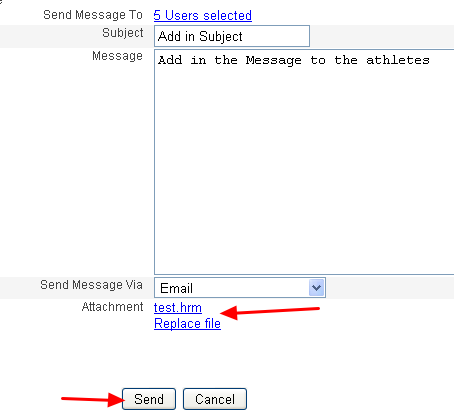 When you are viewing an athlete's history on the Athlete History Page you can click on the "Send Message" button and the athlete who you are viewing will be selected to send a message to. The messaging component is exactly the same as that shown above. You can run a report using the Reports Module. 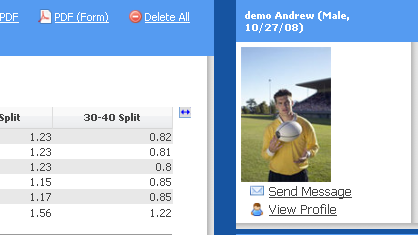 All of the athletes who's data appears in the report can be send a message by selecting "send message". The message box will appear and can be completed as shown in the previous steps.